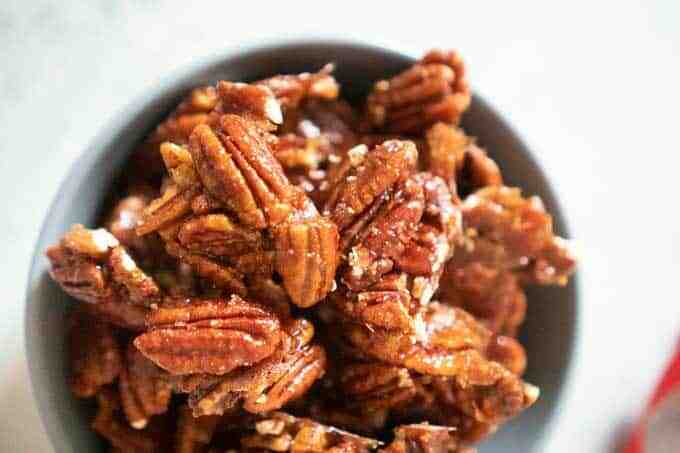 Spicy Candied Pecans | Great Homemade Gift Idea! Growing up my great grandfather had multiple pecan trees on their farm. Everytime we visited in the fall it would be my responsibility to go around the yard and collect the pecans into a big wicker bucket. I loved it! Then we would sit in front of the TV that evening and crack them to prepare for my grandmother to make any number of amazing pecan treats for us the next day. 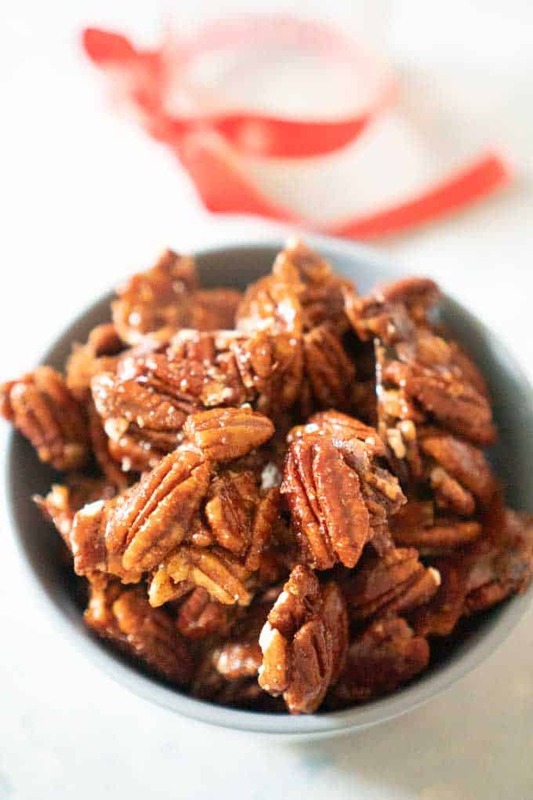 These Spicy Candied Pecans bring back those memories for me every time I make them! These are not your typical candied pecans like I’ve posted before. These pecans have a kick! For some it may seem to be a peculiar combination but I promise you, they’re addictive. 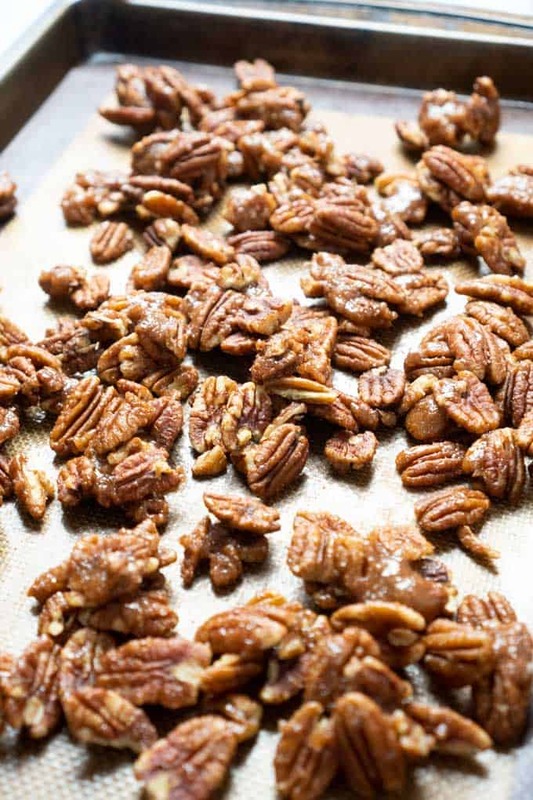 The first taste is just like any other candied pecan recipe…sweet, roasted pecans. Then, a moment later that spice hits and you can’t stop yourself from grabbing another handful! 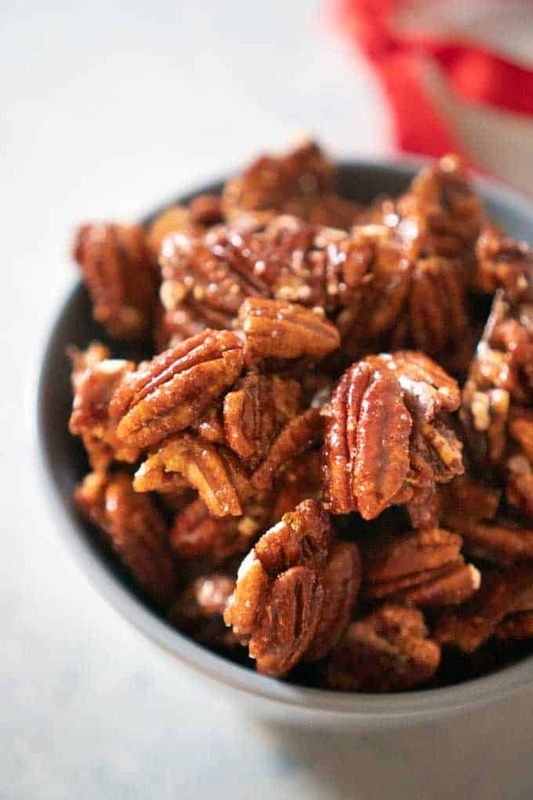 These spicy candied pecans are also great for gifting. Get the pecans in bulk for the best prices in the fall and make in double and triple batches. Package them up in cute little mason jars and watch the “thank yous” roll in! I’m serious, they are that good! 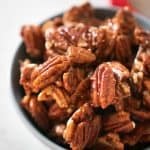 These aren’t your typical candied pecans, these Spicy candied pecans have a kick that makes them downright irresistible! In a medium bowl pour the honey. Stir vigorously to thin. Add salt, sugar, cinnamon, cumin, and cayenne pepper. Stir well. Pour in pecans and press into the honey and spice mixture to coat as best you can. Pour pecans in a single layer on the baking sheet. Bake ten minutes. When you remove the pecans give them a quick stir in the melted honey mixture to coat any pecans that did not get coated before roasting. Allow to cool completely then break apart into singles and clusters. these were totally addictive, definitely one of my new favorite snacks!! I made these for gifts and everyone raved about them, they are addictive! Thanks!